• Too close to M5? Explaining the Alpina B5 is no easy task: It produces more power and torque than the BMW M5, and both cars are based on the same F90 generation of 5 Series, but Alpina promotes the B5’s comfort and refinement as much as its performance. It’s an AMG rival in America, an Audi RS competitor in Europe. Also, it’s exclusive in Australia, and likely to remain so, despite being priced significantly lower than the M5. After a few weeks of driving a Mercedes-AMG E63 S, a Porsche Panamera Turbo Sport Turismo and a BMW M5, this week, it was the turn of the 2018 Alpina B5 Biturbo to come under scrutiny at motoring.com.au. The 2018 Alpina B5 Biturbo is a 5 Series BMW with bespoke wheels, tyres, suspension components, a turbocharged V8 with larger twin-scroll turbochargers and an upgraded ZF automatic transmission. Like its close cousin the BMW M5, the B5 is all-wheel drive, but with a different torque split and handling traits. 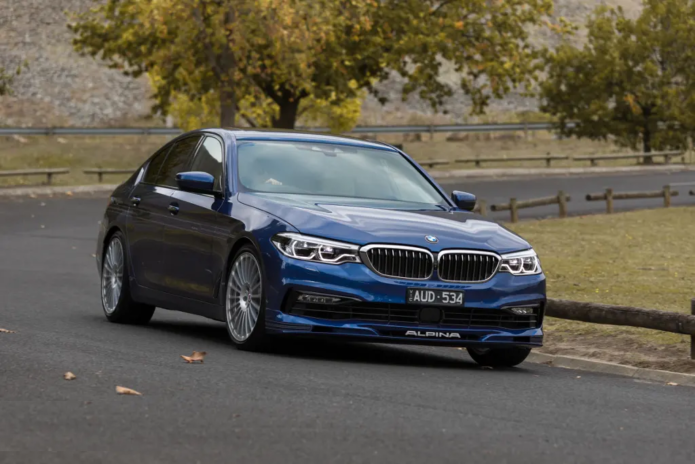 Alpina’s local distributor has released the B5 for evaluation by the local press just a month after BMW launched the M5 in Australia. The latest BMW M5 is a velvet sledgehammer, but the B5 applies another layer of velvet to the aggregate. Like the M5, the 2018 Alpina B5 is rapid and feels very well balanced. The drive program for the B5’s launch was brief – and far from exhaustive – but some points of note jumped out immediately. Firstly, the front seats. The driver’s seat is superbly comfortable and supportive from the moment you sink into it. Change the drive experience mode from Comfort to Sport and the side bolsters clench the driver’s thighs for more lateral support. Even then, the seats remain soft and snug. The driving position is mostly standard BMW design, although the instrumentation changes colour schemes in a Alpina-specific fashion when selecting the different drive modes, and the multi-function steering wheel came with optional wheel heating. Rather than shift paddles, the transmission features buttons behind the spokes of the steering wheel. With hands at ‘quarter to three’, the buttons are positioned ideally for fast shifts with the transmission lever knocked to the left for manual shifts or left where it is for temporary manual shifts in automatic mode. It’s not certain, however, that the buttons would be easy to find with some steering lock wound on. Out on the road, the Alpina B5’s engine note is not as pronounced as the M5’s, even in Sport mode. In Comfort mode the Alpina is quieter still. Power delivery is slightly slower than expected in Comfort mode, but there’s no lack of response in the two Sport modes. The B5 will roundly beat other cars away from the lights on even half throttle. Alpina has calibrated the accelerator linkage so that it precisely opens the throttle in a linear way. Acceleration is consistent with the amount of pedal travel, which makes the Alpina B5 feel more natural hauling away from the lights. The gear changes in Sport mode felt aggressive and dramatic, but were almost as rapid (and significantly smoother) on light throttle in Comfort mode. Once the engine is on the boil, there’s no real need for the transmission to shift any faster than it already does, set to Comfort. After some freeway kilometres and traffic-light-controlled arterial roads on the way out of town, the B5’s consumption was hovering just under 10L/100km, according to the trip computer. The B5 features an idle-stop system to conserve fuel when the car is sitting at traffic lights. It’s not as smooth restarting the engine as the similar system Porsche has developed for the Panamera Turbo, but Alpina is somewhat hamstrung by virtue of its much smaller R&D budget, plus the limited lead time from BMW’s production sign-off. Progressive and ‘talkative’, the strong brakes cope well with soft stopping, which is easier to accomplish in this particular flavour of 5 Series than a 520d Touring recently tested, without the engine restarting as you lift the foot off the brake pedal as the vehicle comes to a halt. There were few opportunities to drive the B5 with enough determination to learn much about the car’s steering and handling, other than the obvious observation that it’s going to be at least as stable and safe as any BMW 5 Series – with the possible exception of the M5. BMW specifies ZF dampers for the M5, but Alpina fits Bilsteins and other unique suspension componentry to the B5. We know that the M5 is impressively agile for its size and weight. There should be little to pick between the two cars for roadholding and handling. I found the steering to be direct, but lightly weighted in Comfort mode. Shod with Pirelli P-Zero tyres, which Alpina says are specifically developed for the car, the B5 rides well even in Sport mode, but Comfort mode is more compliant still. There’s a Comfort Plus mode also, providing the plushest ride quality of all. At speeds of 80km/h and above the two comfort modes just iron out those annoying road-surface irregularities that can create low frequency pitching. At our final destination there was a little time available to pore over the B5, checking out the car’s packaging in full. The B5’s large boot is somewhat compromised by its internal shape, but it does have a ski port that is accessible via the centre armrest in the rear seat. Accommodation in the rear is fit for adults, even with the sunroof fitted. Some more toe room under the front seats would be welcome. There are adjustable vents in the rear of the centre console, with the controls flanked by seat heater buttons. The rear seat also gets its own climate control zone and there are additional vents in the B pillars. As pictured, the test vehicle was finished in Alpina blue outside and Cashmere leather inside, with blue ambient lighting. Over the course of the drive program, there were opportunities to drive Alpina’s other products available in Australia. But in spite of the energetic snarl of the B3 S and B4 S models, or the cossetting serenity of the B7, it was actually the B5 that left us wanting more.